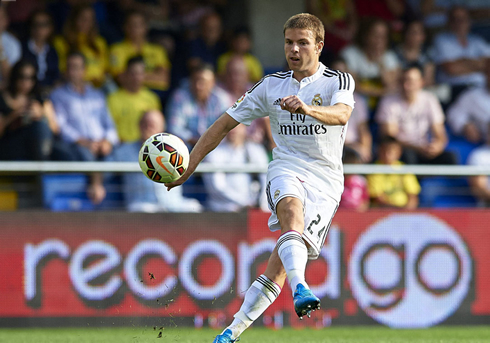 Mission accomplished at the El Madrigal, as Real Madrid took home the 3 points after beating Villarreal by 0-2. The Merengues have much to thank to both Luka Modric and Cristiano Ronaldo, the two players who ended up scoring the visitors' goals in an always complicated trip to the Valencian Community. Real Madrid keep pursuing the top spots in the Spanish League and this Saturday afternoon, they've just went through another obstacle following a well-deserved 0-2 win against Villarreal. Cristiano Ronaldo scored in his 5th consecutive game after having returned from injury in mid-September, but the deadlock was actually broken by a more unusual goalscorer, the Croatian international Luka Modric. With today's 3 points earned in the Madrigal, the Merengues will keep the pressure on Barcelona, Valencia, Sevilla and Atletico Madrid, precisely the 4 teams still standing above them in the Spanish League standings. Next Wednesday, Real Madrid will visit Bulgaria to face Ludogorets Razgrad, for another UEFA Champions League round in Group B. A lot of difficulties were expected in today's visit to Villarreal, but Carlo Ancelotti's men have somehow managed to pass the test with flying colors. By looking at the team that stepped up to the Bernabéu in mid-week to take on Elche, we immediately notice that only 3 changes were brought up. Iker Casillas returned to his place in goal by replacing Keylor Navas, while in midfield it was Asier Illarramendi making room for Luka Modric. In the attack, Karim Benzema was back to his usual spot by taking Isco's starting rights. 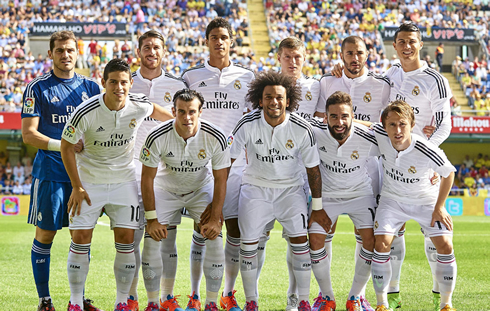 The BBC attacking front was restored and the classic 4-3-3 system was back in place. Despite the 2-goal margin in favor to the Merengues with which the game ended, it was far from being a walk in the park for the European champions. Both teams had the ball at their disposal for pretty much the same amount of time (50% of ball possession for each side) and it was actually Villarreal who got to shoot more than Real Madrid throughout the game (19 shots from the hosts against 11 coming from the visitors). Nevertheless, Real Madrid did find a way to keep their goal intact for the whole match, which was something this team couldn't achieve since August 25, when they hosted and defeated Cordoba by 2-0. With the defense successfully holding the fortress at the back, it was up to a midfield-man to open the hostilities at the other end. In the 32nd minute of the first half and after the Merengues had been passing the ball around near Villarreal's box for quite some time, Luka Modric found himself with space and decided to try his luck from a frontal position. The 29-year old caught the hosts' goalkeeper by surprise and saw his shot going straight into the back of the net, giving Real Madrid the precious lead in this clash. Probably still a bit stunned from that opening goal, Villarreal couldn't react in time and saw Real Madrid extending the lead just a few minutes later. This time, however, it all came down to a pure counter-attack play, which is precisely an area of the game that the Merengues master like few others can. It started on a very long pass executed by James Rodríguez still inside his own half, which would then be captured by Karim Benzema when he was already about to step into Villarreal's box. The Frenchman kept his balance and composure, took a defender out of his way, lifted his head and then delivered a perfect ball to the middle. Cristiano Ronaldo was waiting for the pass and he obviously didn't miss such a great opportunity to bury another goal for Real Madrid and make it 0-2 before half-time. 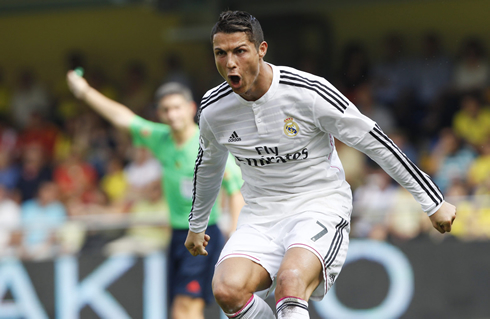 A 1-touch finish that simply showed how clinical Ronaldo can be in front of goal. With the Merengues in front, Carlo Ancelotti ordered his team to slow down the pace of the game in the remaining time we had left and by doing that, to also control their opponent when not having the ball. The strategy worked out quite well and Real Madrid left the Madrigal with the 3 points in the bag, completing their 4th consecutive win after that 1-2 loss against Atletico Madrid on September 13. With this Saturday's goal, Cristiano Ronaldo has finally become the club's 3rd top scorer of all-time in the Spanish League, as he now reached the 187-goal mark. 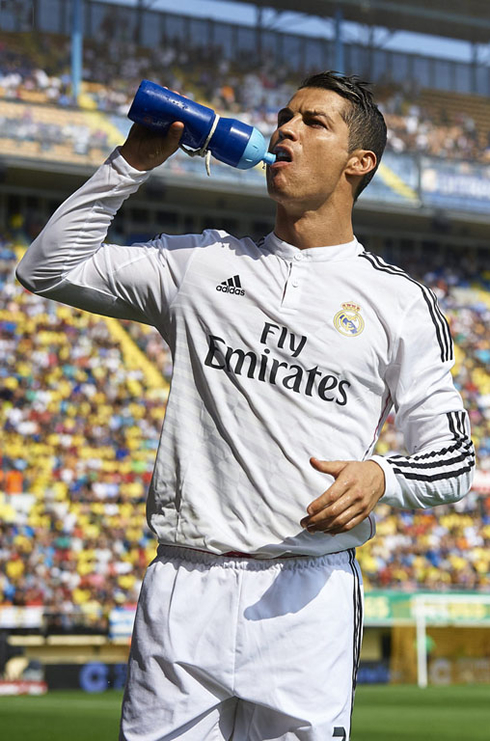 He leaves Santillana behind with 186 goals and now already has his sights on Di Stéfano (216) and Raúl's 228 goal-record. Attackers: Bale, Cristiano Ronaldo, Karim Benzema. Cristiano Ronaldo next game for Real Madrid is against Ludogorets Razgraz, for the UEFA Champions League, on October 1 (Wednesday). You can watch Juventus live stream, Ludogorets Razgrad vs Real Madrid, PSG vs Barcelona, Manchester City vs AS Roma, Sporting vs Chelsea, and CSKA vs Bayern Muncich, all matches provided from our soccer live pages.